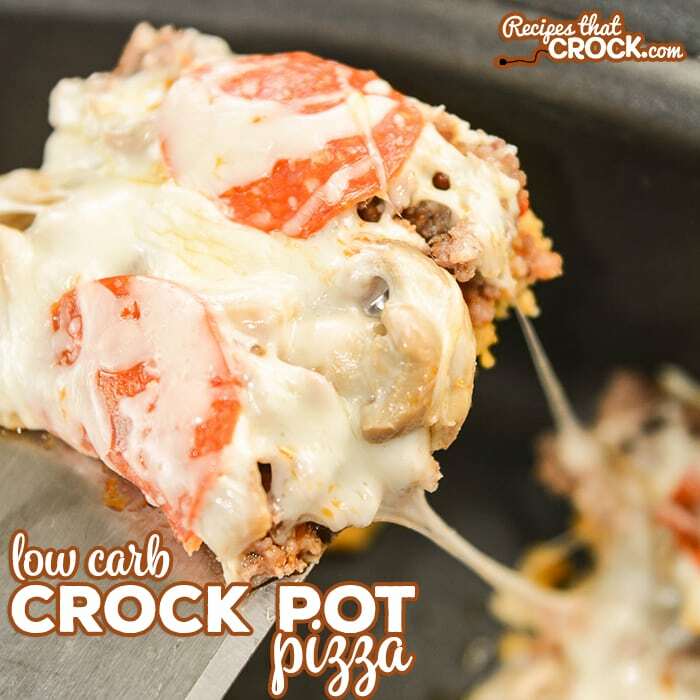 Crock Pot Pizza (Low Carb) - Recipes That Crock! Are you looking for an easy crock pot pizza recipe? 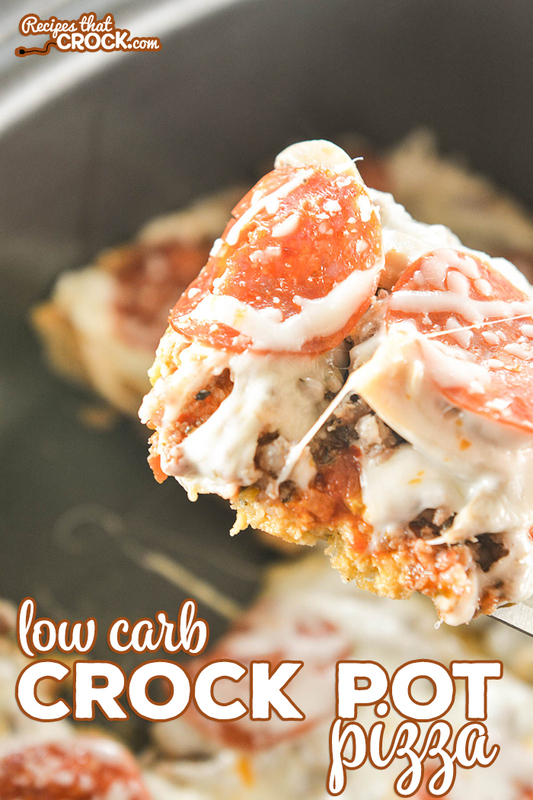 We love this recipe for Crock Pot Pizza with a low carb option! We make it all the time. Readers have been asking us to share our favorite Crock Pot Pizza recipe for a while. We love pizza around here (see our list below) so once we went low carb, we started making our Low Carb Crock Pot Pizza using our Low Carb Pizza Crust any time we got a hankering for pizza. If you aren’t a low carber, you can still make this crock pot pizza (or one of the recipes below), you just need a batch of your favorite pizza dough. You can use your own special crust recipe, grab a tube of the refrigerated dough or whip up a batch from a box or envelope. We use our Low Carb Pizza Crust to make a low carb option for this Crock Pot Pizza. If you aren’t on a low carb diet, you just need a batch of your favorite pizza dough. You can use your own special crust recipe, grab a tube of the refrigerated dough or whip up a batch from a box or envelope. We use our favorite Marinara Sauce because it is a great low carb option, but feel free to use whichever pizza sauce you prefer. We use butter to make this crust buttery and savory. It also makes the crust softer, especially right after cooking. Let the crust cool for best results. Or, if you would prefer not to use butter, use parchment paper down in the bottom of the crock under the crust or spray your crock well with cooking spray. Coat inside of a 6 quart slow cooker with butter. Place pizza dough down in crock and poke liberally with fork. Spread pizza sauce/marinara over the crust evenly. Add favorite pizza toppings and top with cheese. Cook on high for 60 to 90 minutes or until the center of the crust cooks through. For best results, let crust cool before cutting. 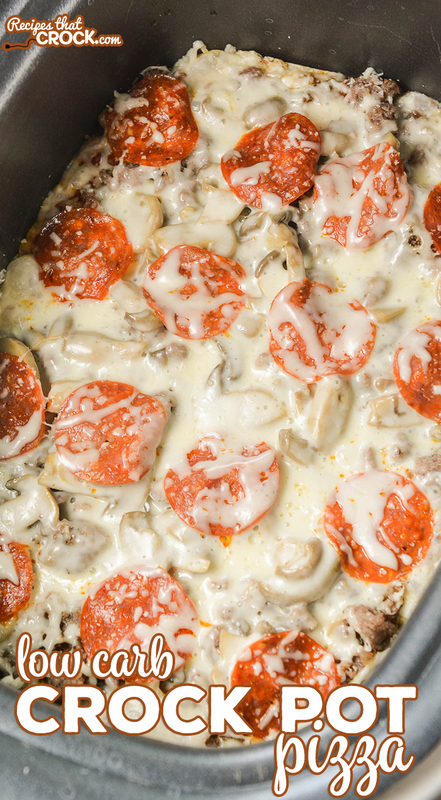 We use our Low Carb Pizza Crust to make a low carb option for this Crock Pot Pizza. If you aren't on a low carb diet, you just need a batch of your favorite pizza dough. You can use your own special crust recipe, grab a tube of the refrigerated dough or whip up a batch from a box or envelope.